I’m fortunate that my Office of Research colleague Lise Smedmor, manager of research communications and marketing, is also a registered dietitian (as well as a sessional lecturer in the Department of Human Health and Nutritional Sciences). Besides setting a good example in the office, she’s a wealth of knowledge on hot topics in agri-food and nutrition reporting. I asked for her top picks as I was heading out the door earlier this week to talk with nutritional science graduate students about strategies for clearly communicating with the media. Along these same lines, the Ontario Federation of Agriculture is sponsoring what it calls a “hot topics booth” at the Royal Agricultural Winter Fair over the next week. It too will be staffed by a dietitian who, in the federation’s words, will help visitors think about the extent that food touches every aspect of life – in nourishment, social undertakings, building a strong country and economy and in protecting the environment and health. I’ll be at the ‘Fair Saturday with six of my agricultural communications students who are part of the day-long Canadian Young Speakers for Agriculture competition. The public is welcome to hear the students’ perspectives on matters such as who will feed the world in 50 years, the biggest challenges facing agriculture and facets of aboriginal agriculture. 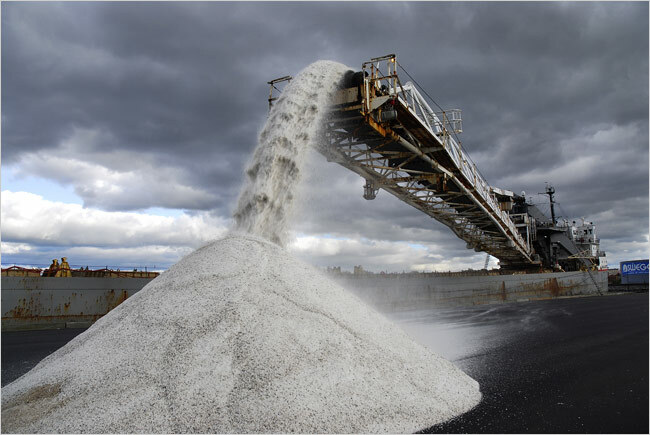 The photo above of salt transport appeared on the Southtown Star blog.